5.2.2 Increase community energy groups’ confidence in donation fundraising. 5.2.3 Work with institutional and sophisticated investors to develop a revolving finance fund. 5.2.4 Foster innovative approaches to electricity retailing. 5.2.6 Develop a funder roundtable to better connect funders and finances with community energy projects and priority initiatives. This sub-strategy addresses the funding and finance needs of developing community energy projects and a wider community energy sector. Progressively reduce costs of community energy projects to increase their economic viability. Maximise revenue streams available to community energy projects. Adequate resourcing is available for community energy support providers. The 2012 Australian Community Energy Opportunities and Challenges report 1 identified the lack of early stage funding as one of the biggest barriers to community energy projects in Australia. The early stage of community energy projects involves taking a project from an idea to a tangible plan: taking it through the pre-feasibility, feasibility and planning approval stages to a point where the projects are investment ready. These stages are the most risky for any renewable energy venture. However, unlike private enterprise or government bodies, community actors do not typically have large reserves of capital upon which to draw. Further modelling conducted by Marsden Jacobs and Associates quantifies the impact of a community energy grant fund at different levels 3. Secondly working with political parties, philanthropic and government organisations to secure commitment to developing more targeted community energy grant program/s and then working with them to design the program to ensure that it meets the needs of the community energy sector. Donation fundraising using either traditional fundraising methods or online crowd- funding platforms is one of the best ways community energy groups can secure the preliminary funds they need to get a community energy project from the inception to the social and technical feasibility stages. While monetary costs involved in this stage can be minimised with large amounts of volunteer effort, substantial costs still remain, particularly in areas which require professional and/or technical expertise. Donation based fundraising is also a great way of proving that a project has support from members of the community. While all fundraising campaigns take work, crowd- funding makes it easy for supporters to make a pledge. Additionally, a number of crowd- funding providers have developed relationships with philanthropic organisations, governments and corporations whereby they provide matching funding to projects who run successful crowd funding campaigns. To date, we know of seven community energy projects have undertaken crowd- funding campaigns, although there are also a number currently underway. Given the potential for increased use of this funding approach, ensuring its success is a priority initiative of this strategy. In the medium-to-long term, if the community energy sector is to grow and thrive it cannot rely on grants (although there is need for them in the short-to-medium term). As such, work is required to develop a fund to finance individual projects once models of community energy have been proven, de-risked and costs reduced. This fund should be a revolving fund, so that when community energy projects pay back loans or provide equity returns, they can be reinvested in loans to new community energy projects. As such, seed capital is required to establish the central fund, and the design details and eligibility criteria dictate how the fund is sustainably replenished over time. An international example driven at the local government level is the Cornwall Revolving Loan fund19 in the UK. Through the development of this Strategy, the authors met with six financial institutions interested in the idea of providing equity, debt and (potentially) early-stage loans to community energy projects. This priority initiative would involve building on these relationships and modelling and supporting the further refinement of financial offerings to ensure that they meet both the needs of the financial institution or investors, as well as the future needs of the community energy sector. Selling electricity is a key component of a community energy generation projects. Currently, the electricity retail market is not set-up to proactively support community energy projects either through the provision of a fair price for electricity or easily allowing member owners of community generation projects to purchase the electricity from the projects they have a stake in. At a regulatory level, the National Electricity Rules do allow for exemption from full retail licensing of smaller and/or specialist retail businesses, particularly for energy being sold directly to a consumer rather then via the network. While this is a partial solution for some models of community energy, it does not address the full range of issues. As such, this priority initiative will to investigate the viability of community focussed retail operations and other innovative retailing strategies that will more fully enable community investment, ownership and focus on local provenance from renewable sources. Community energy groups face higher costs because they are often developing projects at a smaller scale to typical commercial energy projects. These “economies of scale” related costs can be addressed through the development of a series of shared services or shared platforms. A shared service platform could be developed. Thiscentralise some common requirements across community energy projects such an investor share registry, auditing, compliance, registering and receiving payment from members. One international example is Abundance Generation in the UK that provides a platform for community energy groups to secure members and administer funds. One possible structure would be for each subscribed group to pay a small fee to cover the time of a centralised person or people to undertake these tasks. The downside of the efficiency benefit is the potential reduction of local job creation, and as such a shared service platform initiative should work closely with community energy groups to balance local benefits with the efficiency dividends. Specifically, this priority initiative would investigate what service needs are common to a large number community energy groups and whether these services could be delivered at lower cost if they were aggregated across many community energy groups. Note that the cost reduction analysis (Appendix F) suggests that a shared service platform is likely to be most useful for larger community energy projects. For example, Hepburn Wind estimates that shared infrastructure tailored to the community energy sector could reduce ongoing administration costs by 10%. Smaller behind-the-meter community solar models are already lean and shared infrastructure may be more expensive than what a group can deliver themselves. This is in part because groups often provide these services in-kind, whereas a centralised community administration service (e.g. that would manage dividend payment etc.) would have to be paid for by groups. This priority initiative would be complimentary to shared templates or project resources outlined in Section 4.2. Raise knowledge within a range of funding organisations about the current funding needs, priorities and opportunities for impact within the community energy sector. Ideally this Roundtable would meet two to three times per year and have ongoing virtual communication. The Roundtable could be coordinated by an existing funder or funding support organisation committed to community energy such as the NSW Office of Environment and Heritage or the Australian Environmental Grantmakers Network or by the Coalition for Community Energy. Ideally, it would function as a partnership between C4CE and a funder or funding support organisation. How do they cost-effectively secure the funding and finance they need to get a project to a point that it is operating and generating income? How can costs be reduced in both the start-up and operations phase to increase their financial viability? How can income streams be maximised once a project is operating? These questions form the basis of the Finance and Funding objectives and wider sub-strategy. There are several potential funding mechanisms available to community energy projects. However, determining the most appropriate funding mechanism depends on the relevant developmental phase of a given community energy project. There are many stakeholders interested in supporting or being involved in the funding and/or finance of community energy projects. Many are currently looking at different support options, however, when interviewed through the National Strategy process, the current lack of community energy projects near ‘investment-ready’ stage was noted as a clear barrier to the development of sophisticated funding mechanisms. These are the generic stages for the development of a community energy project. Project stages span Inception to Operation and what is involved in each stage varies slightly for different technologies and different models. When community energy literature talks about “early-stage funding”, what is generally meant is the funding required to get a project from inception through to having planning approval and a viable model i.e. are investment ready. 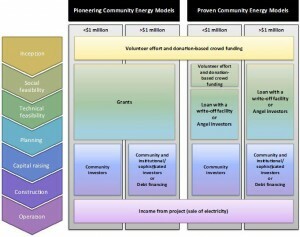 The boxes in the framework diagram in Figure 3 on the following page identify the funding types that are best suited to the different community energy project stages. Community energy projects cover a range of scales. This model suggests an approximate figure of $1 million being the cut-off point between ‘small’ and ‘large’ projects. The authors posit that in the capital raising stage communities are likely to be able to raise sufficient capital through a large number of community investor members for projects less than $1 million, whereas projects greater than $1 million may require some debt financing or equity from institutional investors. This figure is indicative and the exact cut-off between small and large projects will differ from project to project. The pioneering phase, where a model of community energy is not yet financially viable under current market conditions. Note that different models will take different numbers of pilot projects to bring down the costs, set up processes and maximise income streams. It is likely the more complex the model and larger the model of community energy the more ‘pilot’ projects will be needed to shift the model from the pioneering to proven phase. The proven phase, where that has been actively demonstrated to be financially sustainable in current market conditions, with at least one project operating successfully and the supporting resources and processes are in place to facilitate rapid replication by other groups. The Community Energy Model Maturity Index in Appendix D outlines the processes by which community energy models move from the pioneering to proven phase of development. As illustrated in the Framework, (Figure 3) grant funding is required for new models of community energy projects, regardless of size that are in the early stages (to the point that they are investment ready). Once these models have been proven the authors suggest that alternative models of financing can be implemented. Thus, grant funding can be seen as helping to prove the models and take the sector towards maturity. The grant funding, donation funding and revolving financing fund priority initiatives have been developed based on the analysis involved in developing the Finance and Funding Framework. Developing new viable community energy models in the current operating context is a major barrier for the community energy sector. Conceiving, testing, trialling/piloting and refining a new model of community energy takes resources. The first few example projects of a particular community energy model involve ‘pioneering costs’ – that is, the learning and time and effort required to establish and refine new organisational infrastructure for a specific project. The costs per project are higher for these pioneering initiatives than they will be for future applications of the same model. There are a number of institutional barriers to community energy projects, these include but are not limited to: securing a fair price for electricity, accessing timely and affordable grid connection services and approval, complying with ASIC and tax regulations, working through planning processes with state governments and councils on various aspects of project development and delivery. Institutional costs are the costs that are associated with establishing standard institutional arrangements for the community energy sector and overcoming the institutional barriers above. Part of this cost is the time that it takes for community energy proponents to engage with and educate key stakeholders (such as grid companies and retailers) who are unaware of community energy and how projects operate. However, on certain issues such as crowd-financing engaging with stakeholders is not sufficient and regulatory or policy change will be required, which also comes at a cost. For example, altering the financial regulation rules to facilitate and encourage investment-based crowd funding, as is in place in the United States and United Kingdom. As such, some of these costs (the more stakeholder engagement based ones) could be addressed through delivering pilot projects, and targeted sector stakeholder engagement (see the draft National Community Energy Strategy – Profile Raising Sub-Strategy for example actions) while others will need to be addressed by policy or regulatory reform. 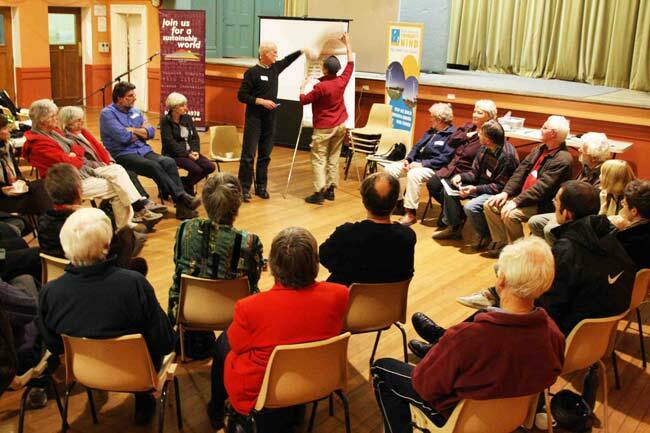 One of the biggest challenges for the Australian community energy sector that has emerged recently is the duplication of effort by community energy projects and groups. A related challenge is access to the skills and knowledge needed to deliver viable and beneficial community energy projects. As distinct from pioneering costs, these are the learning costs that every new community group will have to work through. The local context and mix of community group members all make for unique community energy projects, regardless of employing an established model of community energy. This learning process may lead to task overlap and wasted effort that could be reduced through a series of capacity building initiatives, such as establishing a database of experts or mentoring groups. administering membership dividends; commercial ventures that deal with many members tend to be at a much larger scale and thus project administration is a smaller proportion of the cost. This is not the case in community energy projects where financial compliance and administration currently significantly erodes the return on investment possible for community energy projects. While this presents a challenge to the sector, several sector building initiatives outlined in this strategy are targeted to overcome these issues. Together with specific technology costs, site selection, host negotiation and more there are costs associated with developing a community energy project that deliver local social and environmental benefits, such as the cost of community engagement activities. This is the one area where while costs can be reduced somewhat, there will always be a cost and after a point, any further cost reduction will depend on a series of choices that a community energy proponent makes about the balance between competing commercial and non-commercial benefits. This category of unavoidable costs is included to highlight that some costs inherent to community energy will not be able to be reduced or removed. While the Framework does not touch on maximising income streams, the National Survey of Community Energy Groups highlighted the biggest challenge in this regard is the lack of certainty around energy policy. A lack of policy certainty has long faced the wider renewable energy industry and with the growth of a community energy sector the impact of this policy uncertainty now extends to community enterprises across the country. Policies that specifically effect community energy income streams are the Renewable Energy Target and Feed-in Tariffs. These measures are discussed in the Policy and Regulatory Reform Sub-Strategy. Additionally, measures that could increase the revenue streams for community energy projects are those that also enable investors or members of community energy projects to directly purchase energy from the projects they invest in, thereby closing the loop. Example mechanisms include Virtual Net Metering, innovative retailing approaches such as establishing a community retailer or working with an existing retailer to establish a mutually beneficial relationship. This analysis forms the basis for the innovative retailing priority initiative as well as the Virtual Net Metering priority initiative, discussed as part of the Policy and Regulatory Reform Sub-Strategy. Note that volunteer effort and in-kind services are provided throughout the development of a community energy project, however this Framework identifies those times when volunteer effort is most relied on.